An academic, leadership and mentorship program for Latinx youth in Virginia's Shenandoah Valley. 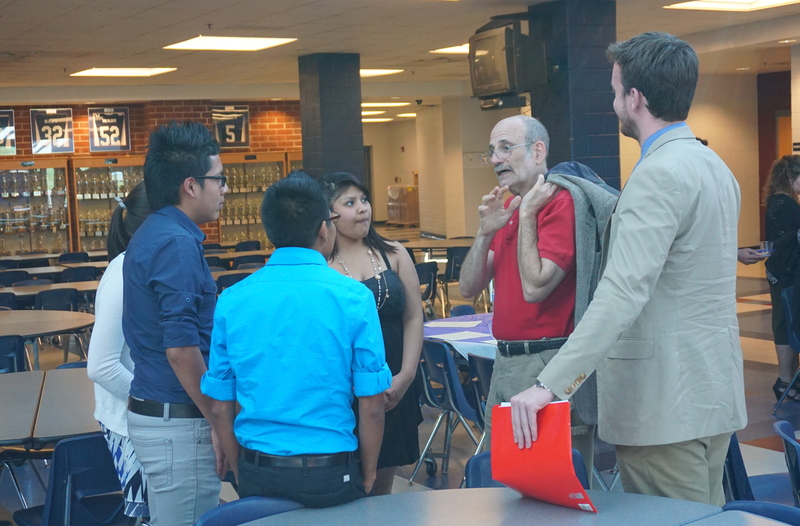 Will (right) listens as Dr. Kaufman talks with SVSLI students. My name is Will, and I am originally from New York City. I am an undergraduate at the University of Richmond, majoring in Leadership Studies, and minoring in Religious Studies. I am spending this summer interning for SV-SLI, primarily working with the high school scholars. I heard about this initiative through Dr. Peter Kaufman, founder of SLI at the UNC, Chapel Hill. He told me about the great work that SLI does with Latino communities in the Shenandoah Valley, and I knew that it was the type of place I would love to work. I am thrilled to be apart of the SLI team this summer! When she said this, I was taken aback — the last words I would use to describe our kids is helpless. The kids in SV-SLI are forces in the classroom, active members in student organizations, and leaders in their schools. Some even work jobs in addition to all this! Driven? Yes. Hardworking? Absolutely. But helpless? Of the many things I have learned working with SV-SLI this summer is that these kids are far from helpless. They are hardworking, and that is partly why they were chosen to be a part of SLI. They are walking proof of the success of many Latino students in our country, and their work ethic puts many college students I know to shame. To put their work ethic into perspective, every one of the SLI students that I have worked with has asked to meet with me more than the scheduled amount – knowing that it means more homework and less free time! I find it inspiring to work with kids who care that much about their own learning and growth, and I am proud to work with SLI to help these Latino kids achieve their dreams of going to college.